So yeah. I did that. I walked like an Egyptian with editors that still make me tremble a little when I'm in their presence. Even better, I have proof! I went to New York to present my first YA novel, Cleopatra's Moon, at the Jewish Book Council. Why? 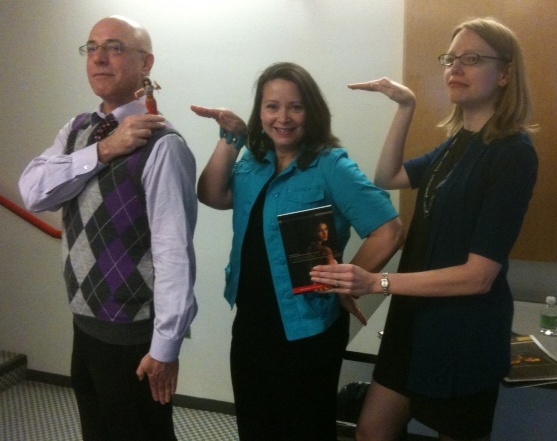 Because they have an unbelievable program supporting book festivals around the country. The Jewish connection in the novel is subtle, but strong: Cleopatra Selene is introduced to the Hebrew concept of free will during a sojourn into the Jewish Quarter of Alexandria (the largest concentration of Jews outside Jerusalem during this period). Her intellectual and emotional struggle with the idea of free will--in the face of tragedy--provides (as Cheryl Klein put it) the "thematic backbone" of the story. 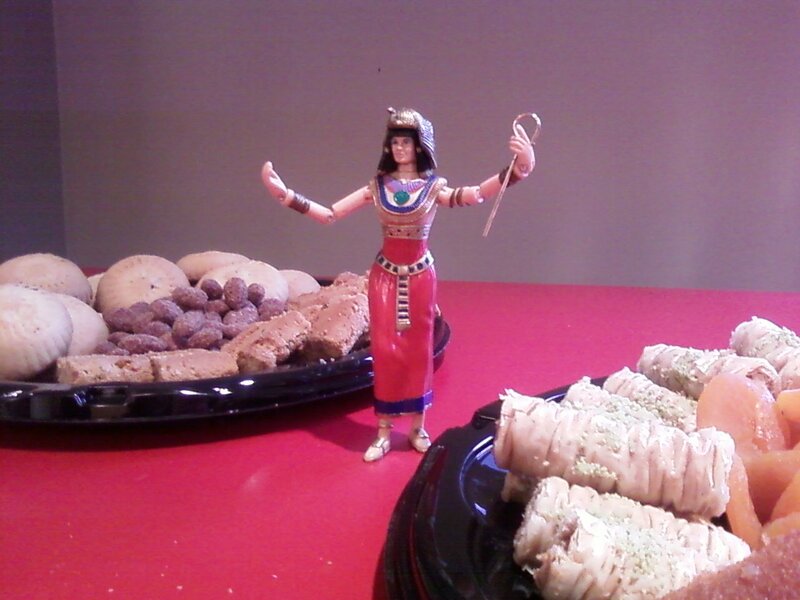 Drag Queen Cleo approved of the offerings. From the JBC, the wonderful Antonio Gonzales escorted me to the Scholastic offices where we had a little "meet and greet" with folks from publicity and sales. We snacked on Egyptian-inspired treats like almond cakes and fig cookies (thanks Cheryl!). Then we had drinks and dinner with several wonderful bookstore owners from the west coast. I must now find an excuse--any excuse--to get out to California and Washington state, just so I can visit their stores. The highlight? Arthur Levine breaking out into song when I talked about my favorite children's book store in Atlanta, Little Shop of Stories. Tireless sales rep, Sue Flynn, personally made the most exquisite Cleopatra's Moon bookmarks for every dinner guest. Seriously, how awesome is this??!! The scan doesn't adequately capture the "oooooo, pretty, shiny!" vibe. Tuesday, I headed to BEA for the children's breakfast. Actress Julianna Moore hosted. I was, um, so star struck by the authors on stage--Brian Selznick, Kathryn Patterson, Sarah Dessen, and Kevin Henkes--that I forgot to take pictures (sorry). Then it was time to check out the immense exhibition. Books, books, everywhere! Of course, I wanted them all. Things almost got out of hand when I happened upon the publisher of this book (right--not a children's book, but still). I grabbed it off the display and made embarassing cooing sounds over it. One of the reps came over to me. "I want this book," I said. "Great," he responded, seeming a little alarmed by the way I was clutching it to my chest. "No, really. I WANT this book, I must have it." Again, he smiled at me, his eyes scanning the area, possibly for security. I fully expected him to smile and say, "Well, of course. Take it! We have plenty!" When he didn't, I tried to explain: nobody else was going to love this book more than me! Couldn't he see that? Never mind that it was not an ARC, but a hardback (and the only one there to boot). I had to have it. The man blinked at my ferocity....er, I mean, intensity. So again I asked: "Can I have it? Please?" Quickly assessing that I was not a bookstore owner and therefore had no value to him, he said, "No." At my devastated reaction, he said, "Come back at the end of BEA and then maybe." "But I'm not going to be here at the end of BEA!" I wailed. He shrugged as if to say, "Not my problem lady." Then walked away. 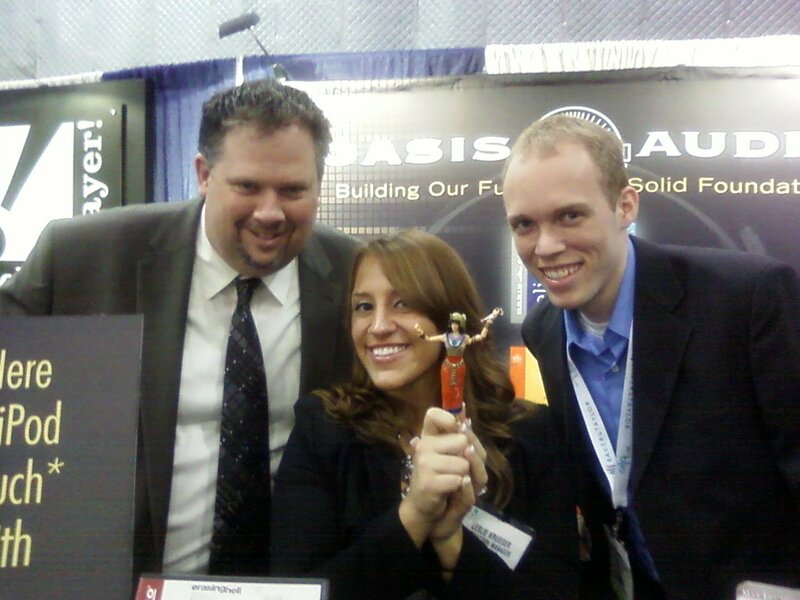 Steve Smith, Leslie Krueger and Jordan Smith of Oasis Audio. I will admit that for one horrible moment, while his back was turned, I contemplated slipping the book into my swag bag and sneaking away. I coulda done it too, if I hadn't thought about the poor author and all the people involved in publishing his book. They all worked hard to get it out there. The least I could do was actually BUY it, right? With a sigh, I replaced it on its display stand. After my close brush with kleptomania, I sought out the Oasis Audio booth. Oasis is releasing the audio version of Cleopatra's Moon at the same time Scholastic is releasing the book. It was great to finally meet Steven Smith, Leslie Krueger and Jordan Smith. I could've hung out with them all day--they're hysterical. Plus, they enjoyed posing with Drag Queen Cleo. After several more mind-numbing rounds of the exhibition floor, I met up with my good friend, Diane Capriola, owner of Little Shop in Decatur, GA. Then, because it would've been a crime for me to go to NYC and NOT visit the Metropolitan museum, I talked her into accompanying me. By the time we got there it was a bit late, but I still got to stand in awe before many exquisite pieces of Egyptian and Ptolemaic art that I had only ever seen in books. No surprise, the Temple at Dendur was breathtaking. In the courtyard of the complex, I looked upon supports for Cleopatra's Needle that once stood outside the Caesarium in Alexandria, guaranteeing that just about every single character in my book stood before it at some point. The Temple itself made me shiver. Octavian/Augustus had it built just years after defeating Cleopatra and Marc Antony in an effort to appease the locals. One day, some day, I'll make it to Egypt. Until then, this would have to do. In the meantime, I'll be forever trying to figure out how to come up with another excuse to visit New York City. Any suggestions? On behalf of those of us who have not yet had the chance to almost steal a book from BEA, thank you for blogging about it! Love this post! And throw my name into the NYC trip 'pot'! Surely we shall think of SOMETHING! I went to the Met in high school and spent the entire time in the antiquities wing. Love that temple. Love the added touch about your characters and the holders for the needle! Ah, your NYC sounded like so much fun! How awesome with all the stuff that happened (uh, except for the meanie who wouldn't let you have that book. BOOO!). I always look at those museum pieces, especially the temples and wonder who decided to bring this thing home with them. I mean, come on, if I said I'd like to take a temple home with me people would just laugh me right out of town. And then think about the poor guy that had to pack it up and load it on the boat. You think they complained? @e--Oh man, NYC would be so much fun together! @Tanya, you crack me up. Just keep at it and you too will be at BEA almost stealing a book. @Karen---hahahaha! I will SO use that line (the "I will use my free will" to do what I want!). @Leslie--LOL and thanks! Gawd, wouldn't it be fun if we lunch ladies could go to NYC together??? ?